I learned to can from the best: my Grandma. I remember hours upon hours at Grandma’s house with Mom and the aunties sitting around peeling peaches, laughing hysterically, shucking corn, chewing the fat, shoving tomatoes in jars, and whatnot. The kids usually drew the simple task of snapping the ends off of green beans. It was kind of hard to booger that one up and it made us feel like we were really contributing to one of everyone’s favourite snacks: Pickled Green Beans or Grandma’s Dilly Beans. Garlicky, snappy, crisp, gently spicy, and utterly perfect, these Pickled Green Beans are incomparable when chilled and nibbled on straight from the refrigerator on a hot day. It’s like a cucumber pickle in flavour but with a crunch times a million. I am a kid all over again -sneaking pickled beans from Grandma’s fridge while she took her siesta- every time I eat one. I wouldn’t say that these are the fountain of youth because the FDA might frown on my claims, but people… it’s pretty darned close. Clearly, my preference is to eat these straight from the jar. There’s more to these than dunking fingers into garlicky brine, though. They make a beautiful addition to salads both of the lettuce and mayonnaise-laden potato, tuna, chicken, or pasta varieties when chopped and tossed into the mix. You’d be hard-pressed to find a better accompaniment to a venison or beef roast come harvest time. Serve a big bowl of these pickled beauties with your Thanksgiving feast (yes, I’m aware it’s August, but canners think like this: “Hey! It’s August. I’d better get cracking on those Thanksgiving pickles and Christmas preserves!) to accolades. Add a platter of homemade pickles to the table next to your Christmas ham or goose. The vinegar tang, garlic punch, and mellow hot-pepper bite cut through rich meals making them taste better! If so inclined, you can even use these crispy, long, pickled-perfection green beans to stir Bloody Marys or other cocktails. So many options, so little time! The only solution is to hie thee hence to the farmer’s market, grab a peck or two of green beans, and get pickling! Pssst. 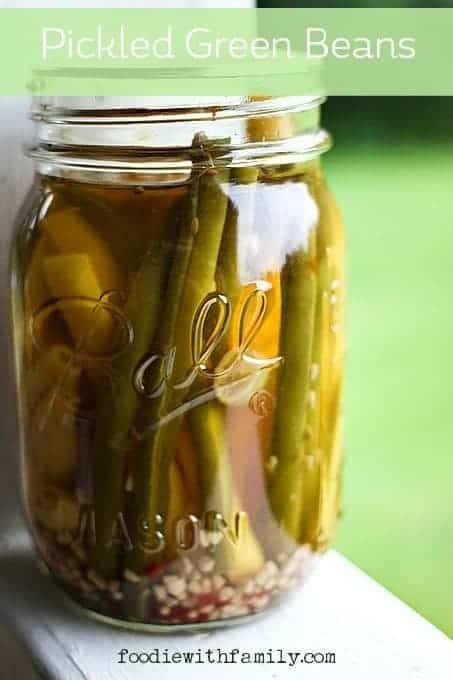 If you’re a canner-or-planner-by-nature, you’ll want a few jars of these gorgeous Pickled Green Beans on hand for Christmas and holiday gift giving or hostess gifts. 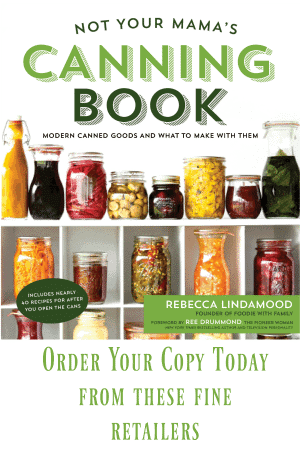 This is a canning recipe that is suitable for beginners and so well loved that it is also a staple of most veteran canners! 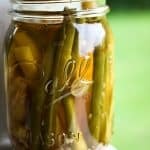 You’ve probably noticed in the pictures that wax beans pickle as well as green beans. I have a weird preference for the green ones although they both taste the same and have the same texture. It’s just a visual for me, but I LOVE the look of both of them in a jar. It feels old-fashioned and frugal. In this one, as in most of my pickling recipes, I prefer to use raw apple cider vinegar because it’s a higher quality of vinegar to begin with. My second choice is regular apple cider vinegar. I don’t use white vinegar in pickling almost as a rule because I find the flavour to be too harsh. IF that is your preference or only thing available to you, however, there is not any safety concern preventing you from using it. You can use fresh garlic in each jar OR you can substitute 1 tablespoon of dried garlic flakes per jar. You can ramp up the quantity of crushed red pepper flakes in each jar if you’re a major hot head, but I really like a gentle back-ground heat instead of a melt-your-face-off heat with these pickles. I’d advise trying the recipe as written for a single batch then increasing if you find it too mild. On that note, you can upsize this recipe to your heart’s content. I usually make at least 5 to 8 times this batch in one go, but I know that the rest of the world is not necessarily gripped by the CAN ALL THE THINGS mania that I have. Need to know how to sterilize jars and all that good, basic canning jazz? I have a handy-dandy guide for you! Garlicky, snappy, crisp, gently spicy, and utterly perfect, these Pickled Green Beans are incomparable when chilled and nibbled on straight from the refrigerator on a hot day. It's like a cucumber pickle in flavour but with a crunch times a million. Trim the green beans so they are of a height to reach within 1/2-inch of the tops of the jars. Load each jar with the additional per-jar ingredients and pile the trimmed beans in over the spices. Set aside. Bring the apple cider vinegar, water, salt, and sugar to a boil in a saucepan. Pour over the green beans in the jars to within 1/4-inch of the tops of the jars. Wipe the rims, fix new two-piece lids in place to finger-tip tightness, and process for 10 minutes. Carefully transfer to a rack to allow to cool completely. Remove the rings, wipe down, label, and store in a cool, dark place for up to a year. If there are any that don't seal, refrigerate immediately after processing. Let the pickled beans sit for 2 to 3 weeks before cracking open and eating! I need to get some of the special canning tongs and make these. I love dilly beans and I have a ton of beans in my garden right now. My mom always put dill seed heads in hers. Love the heat in this variation. What a yummy way to enjoy summer’s best green beans!! This sounds awesome. My husband and I are currently living in Panama but as we live out of suitcases, buying the equipment isn’t practical. Would it work to cook the beans, as if canning without a jar, and then put in the fridge for a few weeks? As much fun as it is traveling around and trying new things, I really miss simple things like this! Love, love, love. I forgot about dilly beans and now I am going to make your recipe. It sounds perfect! I love this idea! I was overgrown with green beans in my garden last year and could have used this recipe! I’ve never tried pickling but the idea of the flavor of a pickle with that crunch, oh man, I’m so in! I pretty much have the same memory of snapping the ends of green beans!! I didn’t particularly like doing it as a kid but now, I find it so therapeutic haha! 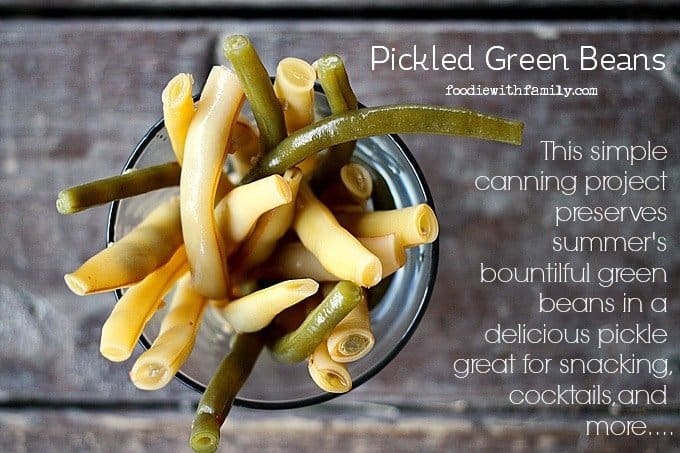 That’s a great recipe, I have never pickled green beans myself — about time!! I love this post! My mom always gave me the job of snapping off the green bean ends when she canned (green beans, homemade salsa, jams/jellies, you name it). Since I moved away from her and my father’s more agrarian small-town lifestyle, canning produce you grew yourself is one of the summer traditions I miss the most! 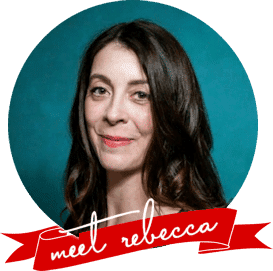 Btw, I LOVE your blog. You always post the most incredible recipes and you always make me laugh! “hie thee hence” + frown? I’m keeping you FOREVER. Thanks for the grins. Plus, I need these beans in my life. OMG. I ma all about pickled green beans right out of the jar. Same goes for spicy pickled asparagus. Sooooo good! If you are allergic to dill or just don’t like the flavor, what would you recommend as a substiute for it here? You can omit them… There’s no safety reason to keep them in, but if you do omit or change out the dill, it will alter the taste and they will no longer resemble Claussens. Love love love the sound of this recipe. I’ve always loved pickled green beans but have never been brave enough to try them, definitely think I’m going to tackle them now!Thanks! Question…..What’s a dill head?? These look amazing. I think my friend is growing beans this summer. Maybe we can have a joint venture. I’ve been waiting to can things because I’m just too nervous but oh how I want to can these! I’ll have to give it a go. It was so great to find your blog. This reminds me of my grandpa. He used to make these in summer and he enjoyed eating them as a morning snack. Can I use this recipe and safely omit the sugar?. I cannot have sugar but this recipe sounds perfect beside the point. You can safely omit the sugar in this particular recipe. The acidity is what keeps it safe and the only reason the sugar is there is to take a little edge off of the vinegar. If you can do other sweeteners, you may want to do something mild like a clear or light agave in the place of the sugar! Thank you for sharing! I can’t stop eating these. Very crunchy and tasty! Oh, and fun to make! There’s nothing in the recipe that tells what size jar to use or how ma you jars it makes. If, God forbid, something nefarious is growing in your jar, it could very well create gas and loosen the seal on a jar lid, meaning it won’t make that satisfying “schlooop” sound when you open it. If a jar lid lifts easily from the jar, you know it’s possible something bad is in there. If you store the jars with rings in place, it holds the lid in place and doesn’t offer the lid the chance to lift away. Thanks, William! They’re awfully delicious! It’s nearly Winter and we have a lot of green beans. Thank you for sharing beautiful memories. Luv and greetings from South-Africa. Thank you, Roeleen! I hope you love these pickled green beans!